Okay, so these were going to be super easy in my mind, and they are but they were surprisingly messy so just be prepared. I tried a variety of methods to get a hole in the gum balls, skewers, drilling etc. What works the best is to first pre-drill them with with the smaller bit and then re-drill with the larger one. If you just use the smaller bit it will allow the ribbon through but it's a bit snug and I cracked a few trying to thread the "pearls". If you just use the larger bit it will cause cracking as well. Make sure you drill your gum balls on top of a scrap piece of board in a large tray. The board gives the bit something to sink into when you exit the gum ball and the tray will contain all the gum pieces produced by the drilling. I was making these for eight and nine year olds and we found that 50" of ribbon and 8 gumballs worked the best. 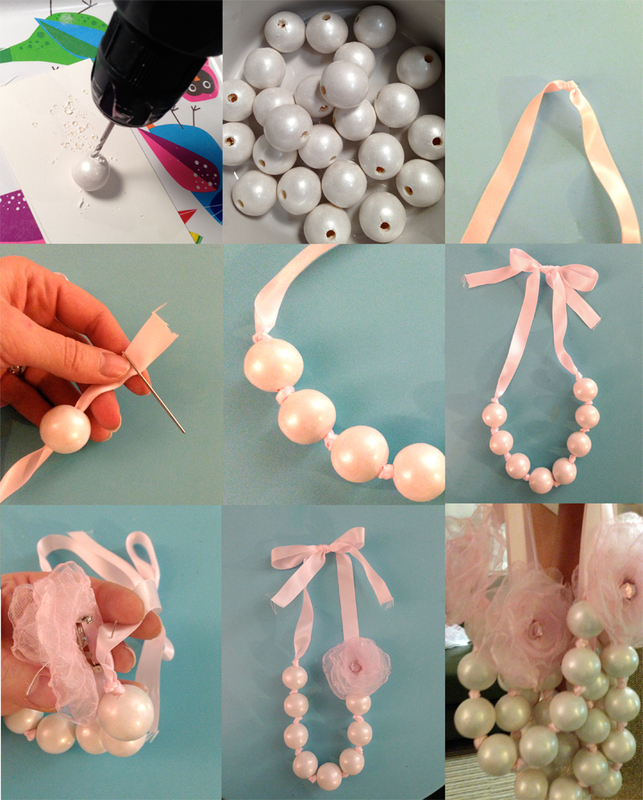 Take your ribbon and tie a loose knot in the center, keeping it loose it will give a bit more volume between the beads. The yarn needles have a nice big hole to accommodate the ribbon, thread just the end through and pull an inch or so through. You don't want to crinkle the ribbon by pulling more that that through. Thread your gum balls and tie a loose knot after each, tie as close to the gum ball as you can. Work your way out from the center and you should have roughly the same amount of ribbon on each end. After you've strung four gum balls and made four knots, hold the necklace up and allow roughly 5-6" of ribbon to hang between your fingers and first bead. Tie a nice bow at the top. I found if I held my finger under the bow the pearls would naturally hang asymmetrically. On the side where the pearls looked a bit lower I'd pin the fabric flowers. An Art Licensing True Story with The Moon From My Attic!